Banner Ad is the traditional, most familiar path to reach a huge audience. A creative banner ad connects with the viewer generating their interest in it and transforming their thoughts towards making a buying decision. Digital world expansion provided interactive ads that possess a great potential to involve the viewers in an ad. There are hundreds of ads on digital platforms, but audience leans only towards creative banners. Thus, make sure you present creative ads for your digital campaign using these innovative and significant tips. Business or marketing, the target audience is the most valuable key asset. Addressing the specific targeted audience can help you build and mold the campaign ad as per their requirement and understanding. Therefore, the outcome will make more engagement and more conversions. Moreover, make sure landing page of your ad contains same design and language for compelling user-experience. The digital approaches have furnished useful and intuitive results better than the static ads. With such modern creative techniques, you should involve the viewers into the ads to increase users’ retention. For this, go for rich media banners including animation, gamification, and similar approaches. Indeed, animation effects bring a strong flow in the ad for the viewers. However, excess animation impact can lead to complex structures and fewer response rates. Conveying a message is very important through the animation, the creator must keep it simple as a rotating text of additional information. Such original animation use can garner better user attention as well as retention. Ads are meant to attract viewers towards a product choice presented by a firm. The straight and straightforward ad knock the minds of people and if mixed with a big pitch can result in great user response. For example, include memes in your ads as a fun tool with no offensive message. It is an excellent way to better connect with the viewers by hitting the fun side. Humor is an excellent way to attract people in the real world, and so it can do through the ad. Yes, an ad with a fun element not only attracts viewers but also gain virality with pace and eventually reaching out to a wider number of audience. Make sure you insert a balance of witty and intelligent, and not the cheap side. In the digital area, it is possible to involve your viewers in your ads as discussed above, one more way to do this is to question them. Prompt questions relevant to ad’s niche like ‘Are you unable to share your files quickly’ for a sharing app, evaluating their present status. Then you can give your offerings and product benefits through ads along with a call to action. As mentioned, a picture depicts 100 words; drive your audience interest towards your service through an image blended with your creativity. Go for simple and funny creatures that have the potential to make the user feel connected. Digital technologies and platforms make you innovative and progressive firm. However, you can often face problems and confusion in contributing to an ad. In that case, grab new tools suggested by established publications that can help you composing interactive ads. One of the tools is SnapApp, which provides quiz interface, animated infographics, and much more for a digital ad success. Creative banner ad when presented with appropriate techniques and according to the users’ interest, gains excellent response. 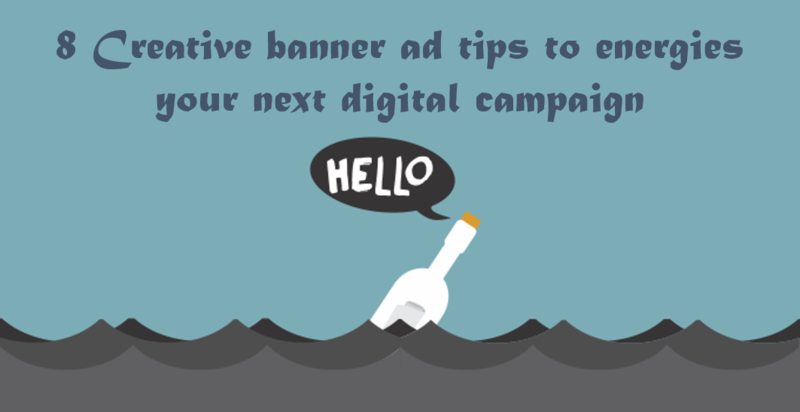 Briefly, above tips are helpful to make your next banner ad a success on digital media. ⟵Infographics in your Marketing Strategy is a Way to Play Safe. See How? I like that mention making your banners really humorous. My sister is looking to create some banners for a house party and needs tips. I’ll be sure to talk to her about making them really humorous! We are happy to receive the appreciation! We are continuously trying to help people with the effective blog information.